Thank you for your messages and interest in the Milk Workshops. It’s been a very busy and productive year for us. We’ve been involved in quite a few really cool, commercial projects which we are going to share with you here in a near future. This post will be brief and just to let you know that we are going to run our Milk Workshops this year. The closest one is going to be in OSLO, Norway on 13-14 May 2017. We have an invitation to go to New York, USA and Australia too and these workshops are in preparation. We have prepared a new material for you, focused on the commercial side of the industry. We will show you how we work with our individual clients, advertising agencies and the press. – We will open the event with a presentation sharing the complete Milky Know-How! – Then take you through the Milk Photoshoot – From A to Z – working with a model and team of assistants on set. – After that participants will take over and will throw the Milk on a model trying to photograph a unique illustration. – We will close the day with a BANG – taking you on a full on commercial style shoot on a pre-built set. Applying a time pressure factor showing you what the real game is all about. – We will share our RAW photos from the day one – and then we will take you through a mind bending postproduction process. – Even though there is a lot of ground to cover – no one will be left behind and photographers with all levels of skills are more than welcome! 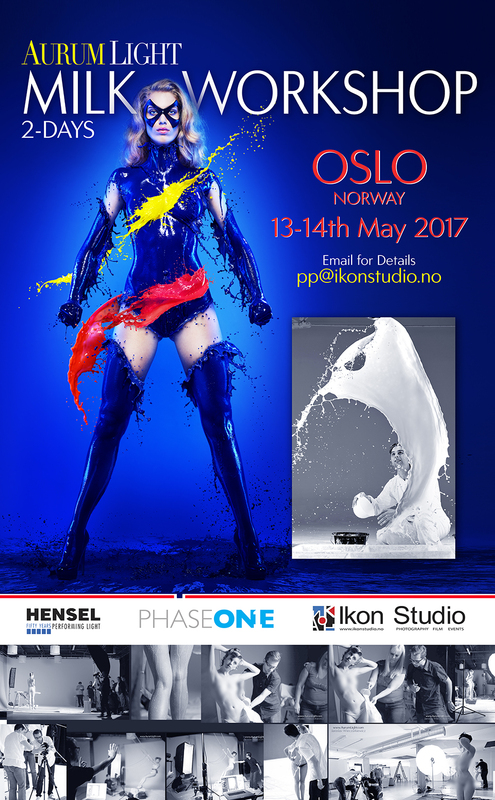 So if you would like to be a part of some amazing image making just book your spot here >>> and join us in May in Norway! In Oslo we will be hosted by an amazing team at IkonStudio.no We worked together in the past on our SplashHeroes series and I can tell you that this place is amazing and will help you create literally anything. Hope to see you in Norway!